Almost everyone has had dreams of living the life of a cowboy. Carefree, relaxed, tough as nails, riding the open range, sitting around the campfire eating beans and telling stories. Well, these dreams can come true on the Rockin’ R Ranch, a “Real Old West” working cattle ranch. The best dude ranch vacation available. Whether you’ve dreamed of being a cowboy or not, the Rockin’ R Ranch provides an unparalleled opportunity to get back to some country basics that will refresh the human soul and body, making you feel like you really are a cowboy (or cowgirl). Cowboys have always had a gift for making their work fun, and we want you to have fun with us. Horseback riding, of course, is the main event at the Rockin’ R, and we’ve got plenty of horses. Whether you’re a beginning or more advanced rider, we’ll find a horse that is perfect for you. Our trail rides will take you through the fields and meadows and up into the hills and mountains behind the Ranch. 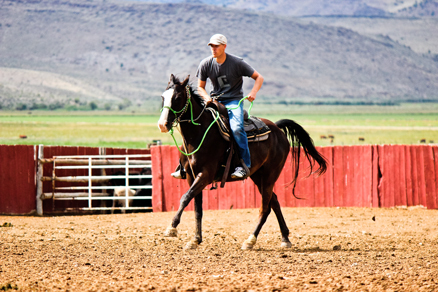 In our large outdoor riding arena, you can participate in your own rodeo where you can try your hand at barrel racing, pole bending, roping, and other fun “cowboy games”. Archery may prove to be your talent as you release your arrow into the target’s bullseye. You may enjoy a hike to Bandit’s Hideout to see where Butch Cassidy may have spent time hiding from the law, or a hike in Antimony Canyon where the old mines are just a small part of the beautiful scenery (be sure to sniff the “butterscotch” tree). And on a hot summer afternoon, what better way is there to cool off than on a rubber innertube floating down the river or swinging on the rope at the edge of our swimming pond and splashing into the cool water. Don’t forget to take a slow tour of our small Antimony community on our horse-drawn wagon. Singing along the way is optional, but encouraged. Evenings may find you roasting marshmallows around a campfire or working up a sweat while line dancing to the western tunes of our band. There’s plenty to do here at the Rockin’ R Ranch. Your stay with us includes lodging, meals, and activities so you can focus on having a great adventure. 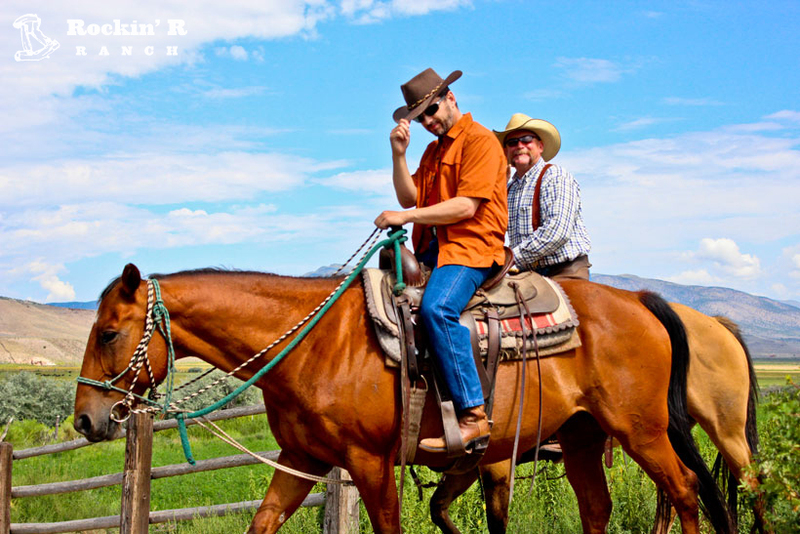 Guests from all over the world have spent time on the Rockin’ R Ranch. 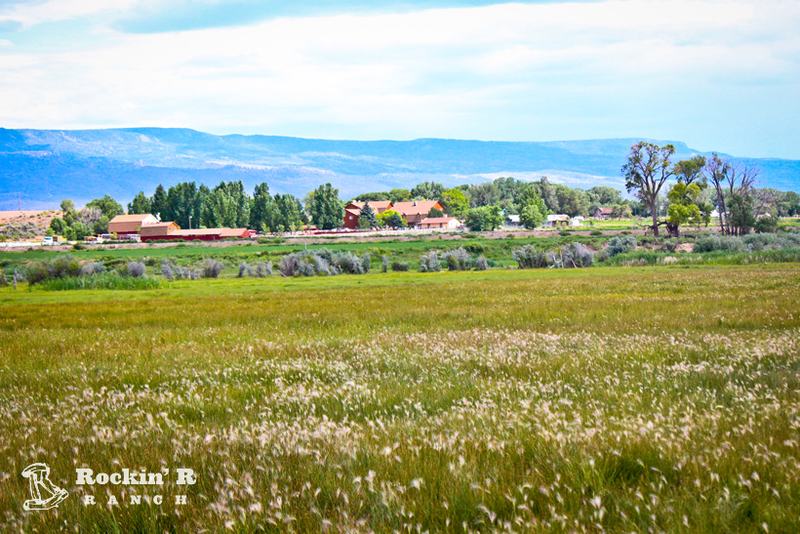 The “Old West” comes alive when you come to this working cattle ranch with comfortable guest facilities. Yes, we still do it the same “Old” way they used to do it in the 1800’s. We grow hay, feed cattle and horses, brand calves, ride, doctor the cattle, round ‘em up and drive ‘em to the grazing areas. Not much has changed. You can do as much or as little as you like, but, no matter what, you’ll always remember that you were on a ‘Real Old West’ cattle ranch. In order to stay in top form for our wonderful guests, our staff and our horses need a day to rest and be rejuvenated each week. So when planning your vacation with us, keep in mind that we close on Sundays just after our Saturday-night guests have breakfast and depart, and won’t open again until Monday morning. The Rockin’ R Ranch has a number of friendly ranch dogs who are accustomed to our ranch setting, the horses and other animals, and our guests. Due to many variables, we do not allow our guests to bring their own pets to the Ranch, not only for their own protection, but for the peace and safety of our ranch animals and other guests.